The Andes Mountains are located in South America, running north to south along the western coast of the continent. The latitude is 10° N. to 57° S. The longitude is 70° W. to 80° E.
The Andes Mountains are the longest and one of the highest mountain ranges in the world. They are located in South America and stretch 4,500 miles from north to south, along the west coast of the continent. The climate is not the same throughout the biome because there are places nearer to the equator than others. The Andes are separated into three natural regions: the southern, central, and northern regions. In the northern region, it is hotter because it is closest to the equator. There are rain forests in this region, due to the more humid, rainy climate. In the southern region, the mountains are nearer to the Antarctic and it is much colder. It is not very populated in the southern area. In the central region of this biome, the weather is more mild because it is not near either the equator or the cold Antarctic. The largest herb in the world, Puya raimondii, grows in this region and can survive at high elevations up to 13,000 feet. The herb can also live for 100 years. The herb's leaves all grow from one big stem, which allows for moisture to run down the leaves to the base of the plant. So during times of drought, the plant can survive. Many of the plants which grow in the Andes Mountains are small in size to conserve energy. Their leaves can be stiff and strong to protect them from frost and cold weather if they are high in the mountains. The Andes Mountains supply many birds with homes like the Flamingo, Andean Flicker, the Condor, and the Hillstar Hummingbird. Types of land animals include the Mountain Lion, the Red Perll, and Llamas to name a few. The Spectacled Bear also lives in this biome. The Giant Toad and Andean Iguana are some examples of reptiles. This iguana is one of the few lizards found in that cold climate. 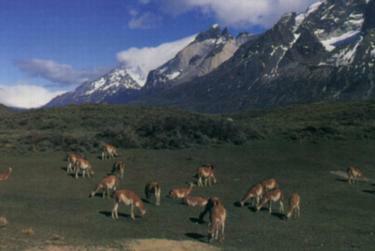 The Andes Mountains are hurt by humans because they cut down trees which shelter many unique Andean animals. Man also mines for gold, silver, and copper which then erodes the soil and hurts the plants of the Andes. 1999, printed in the U.S.
Knapp Gregory. "Andes Mountains" World Book Encyclopedia Vol. 1A Chicago. World Book Inc. 2000. p.453-454. "The Year of the Mountains," http://www.mountains2002.org.